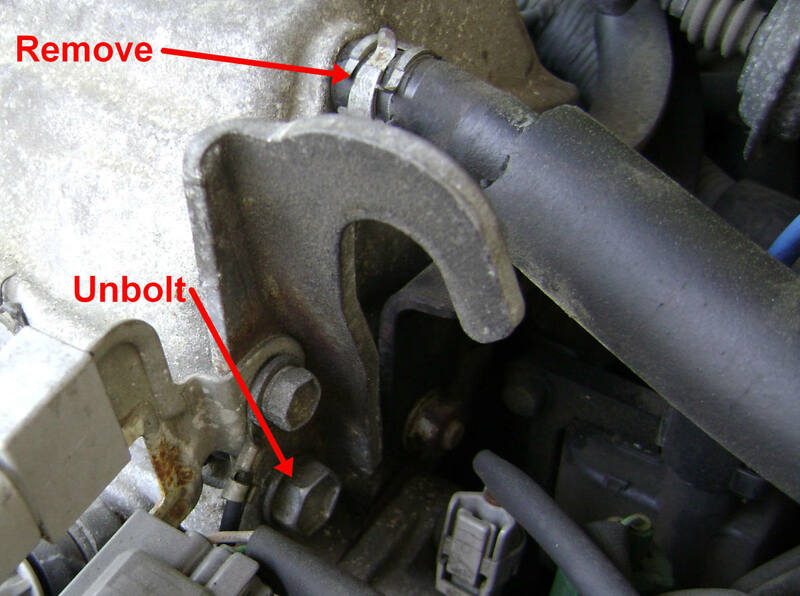 Here are the three most common sources of oil leaks from the Camry I4 5SFE engine. Worn oil seals from the camshaft, the crankshaft, and the oil pump sprocket seal and gasket. These seals and gaskets are typically checked and replaced when performing a timing belt replacement. If leakage becomes excessive, you might want to go ahead and replace your timing belt ahead of schedule, since oil contact with the belt will reduce its longevity. A timing belt saturated with oil will eventually break prematurely and without warning. 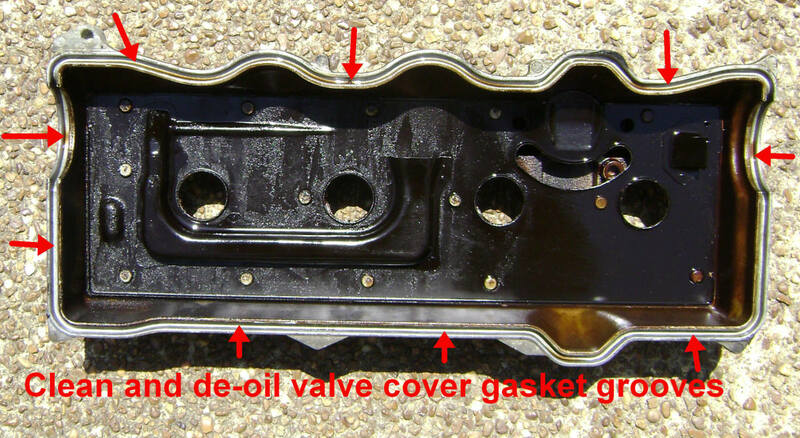 The valve cover gasket has shrunk, dry rotted, or simply lost its ability to seal. Since the top of the engine is tilted towards the firewall, the majority of the oil leak will accumulate on top of the intake manifold by the fuel injectors. The oil may continue to migrate down to the oil pan which may give the illusion that the oil pan gasket requires replacement. Applying silicone-gasket-maker material onto the valve cover gasket, a trick I've seen tried often, does not work, and oil will continue to leak. 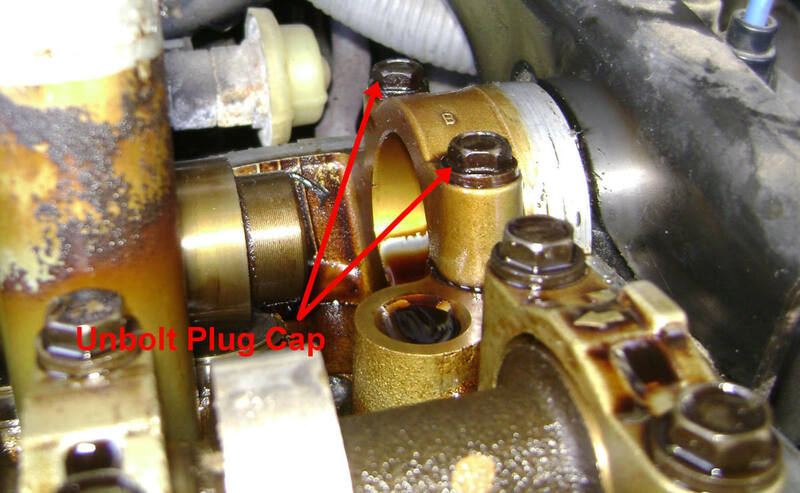 The rubber coating on the valve cover/cylinder head plug (located to the right of the engine when facing the engine), has shrunk or cannot maintain a good seal. 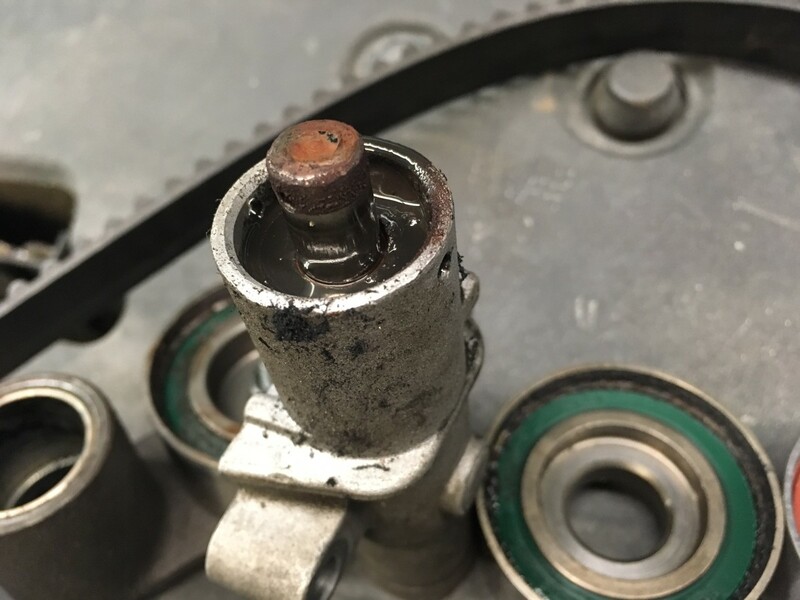 Toyota added this plug when they replaced their camshaft-driven ignition distributor system with solid-state coil packs. 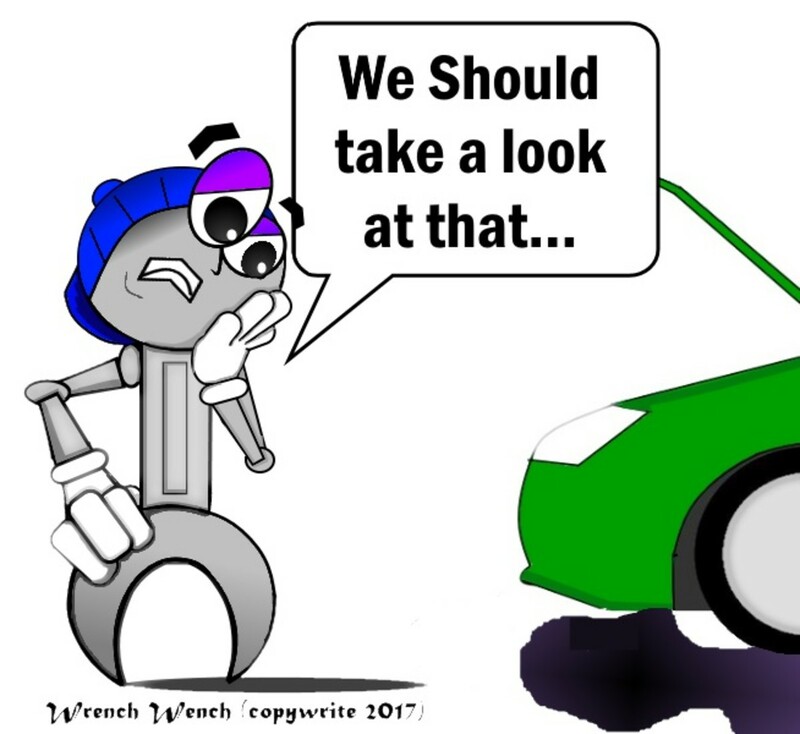 If Item 1 is your problem, you will want to replace your timing belt, as discussed in another article. This DIY article will address items 2 and 3. If a leak is detected between the inner CV axle shaft and the transmission—if you see seepage stains below where the CV axle meets the differential, or drip marks on the ground in that area—the problem may be a transmission fluid leak from a worn axle shaft seal. 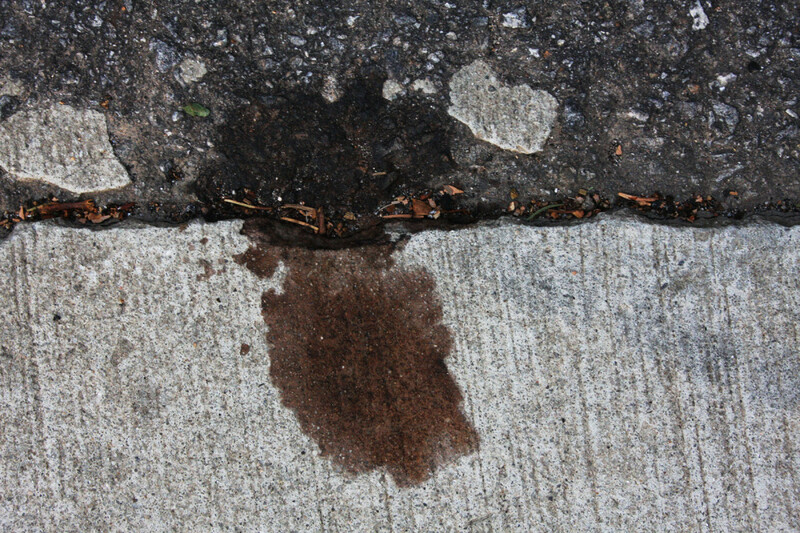 A leak here will cause the level of transmission fluid (ATF) to drop gradually. 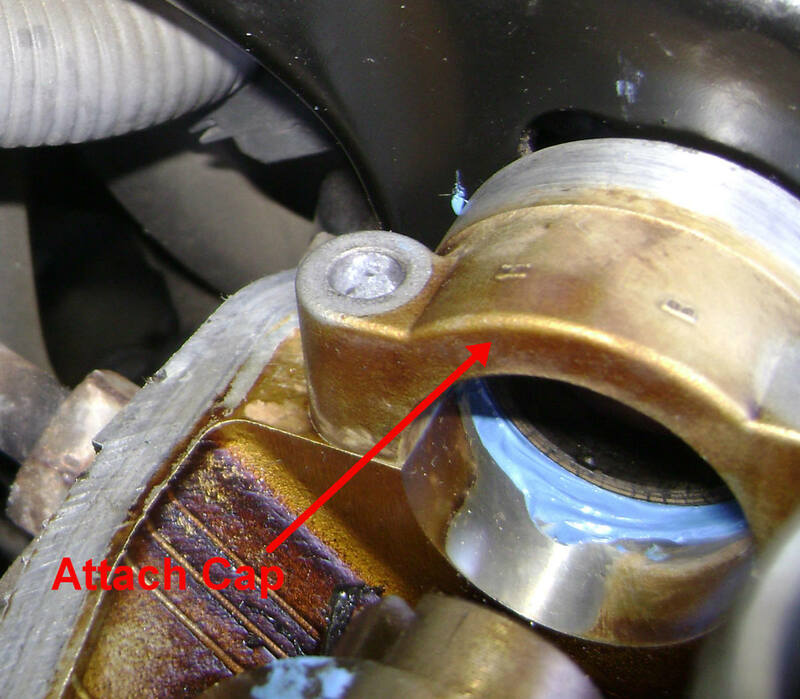 Another article of mine shows how to replace the axle and seal. If the number one and two fuel injectors show a film of fresh oil, or accumulated dirty oil, the valve cover may be the culprit. The source can be further validated by removing the front passenger-side wheel and inspecting the power-steering pump. If the pump is wet with oil, the leak has migrated from the intake runner down to the back of the engine block and then to the power-steering pump. This is assuming that the power-steering pump itself is not leaking; if it is, the power steering fluid level will be dropping. Again, the source of the leak can be verified by removing the front passenger-side wheel. 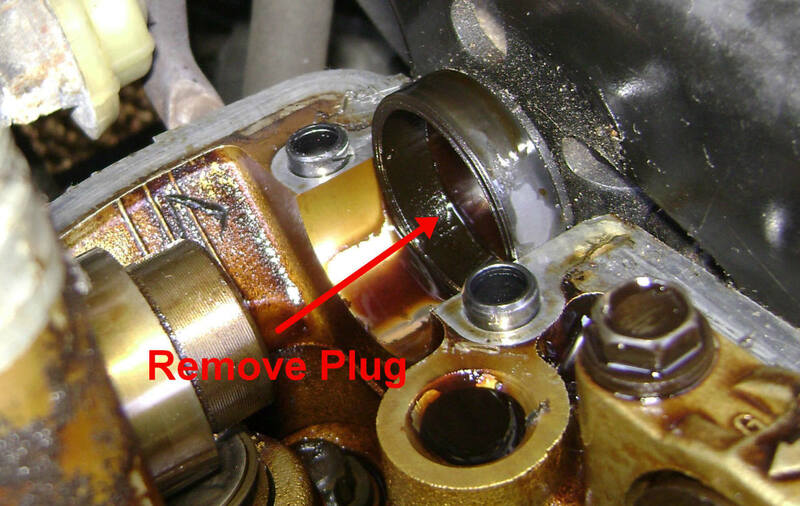 If an oil film appears at the base of the lower timing belt cover where it meets the engine block, then the camshaft or crankshaft seal, or the oil pump seal or gasket, may be leaking. The timing belt cover must be removed to determine the exact cause. Unless the leak is transmission fluid coming from the inner CV axle shaft seal, the cylinder head plug (the half-circle hump on the right side of the engine by the ignition coil packs) is leaking oil. 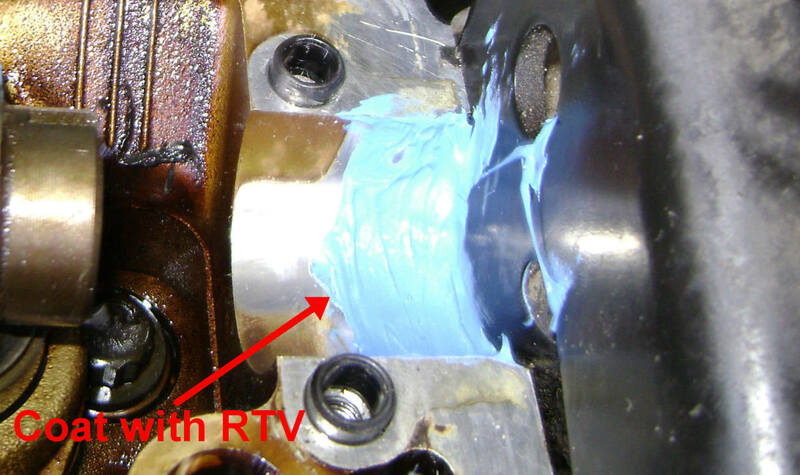 The 2-minute video below provides you an overview on recognizing a valve cover gasket that needs replacement. 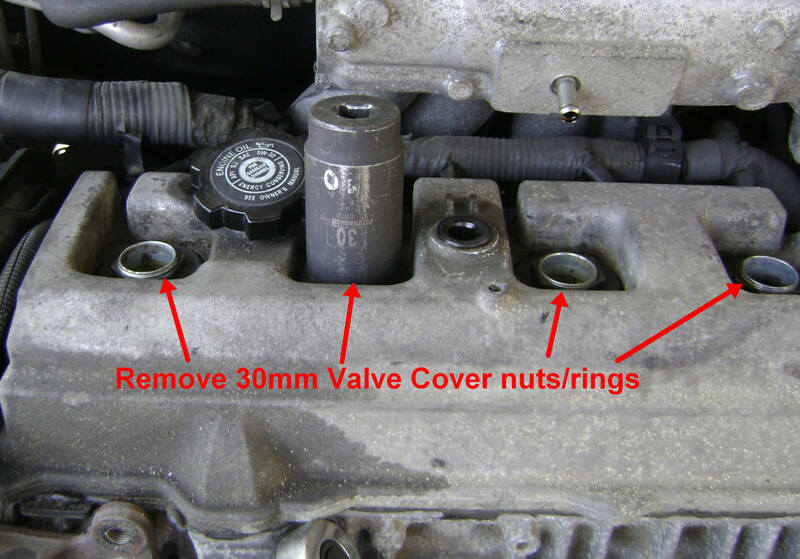 The below 5.5-minute video will provide you with step-by-step instructions for removing and installing a valve cover gasket on a I4 Toyota Camry. Instructions in text form follow the video. 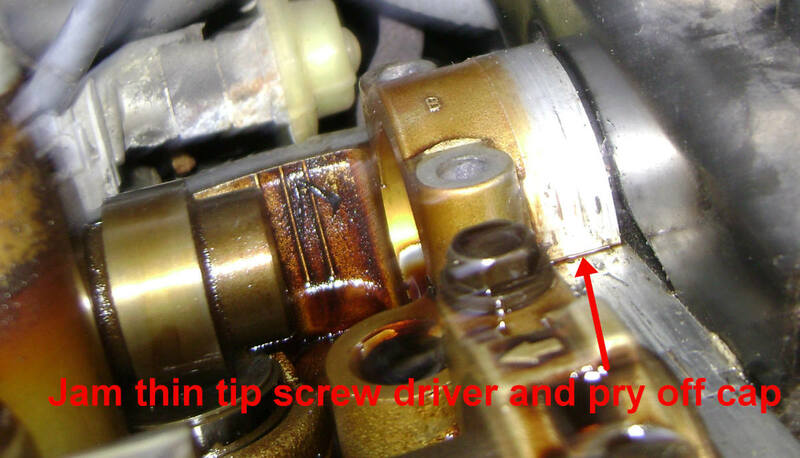 The 7.5-minute video below will show you how to repair oil leakage inside your spark plug tube. 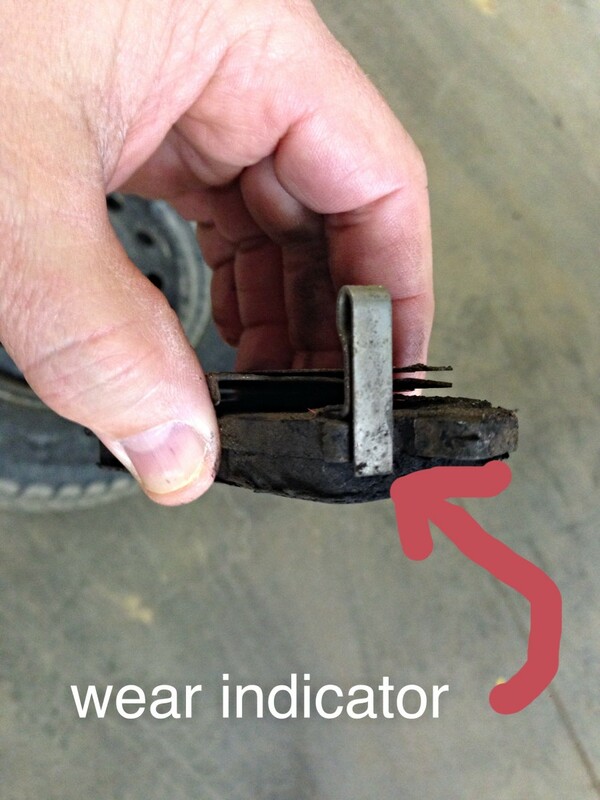 If this problem is not corrected, you may experience ignition misfire and possible damage to your coil pack. 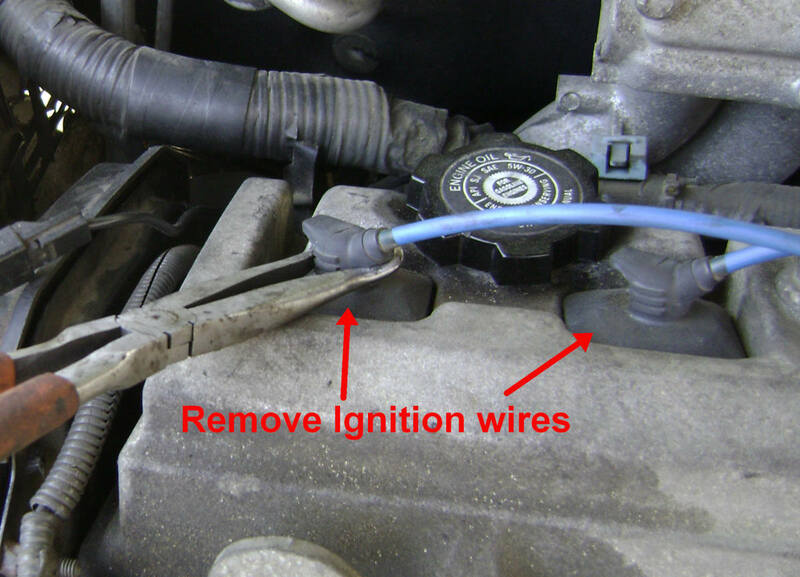 Remove the ignition wires. Using either bent-end or needle-nose hose pliers will ease removal. Disconnect the vacuum line from the right side of the valve cover. 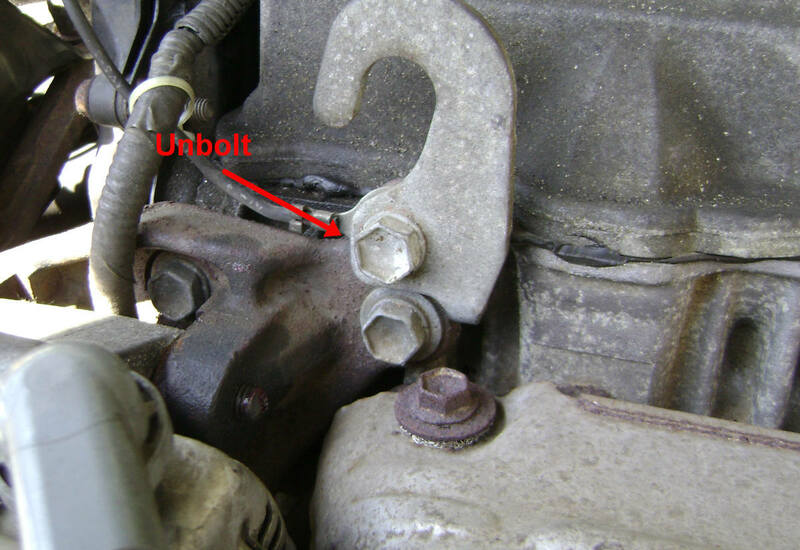 Unbolt the two engine hoist hooks from the front left and right side of the valve cover. 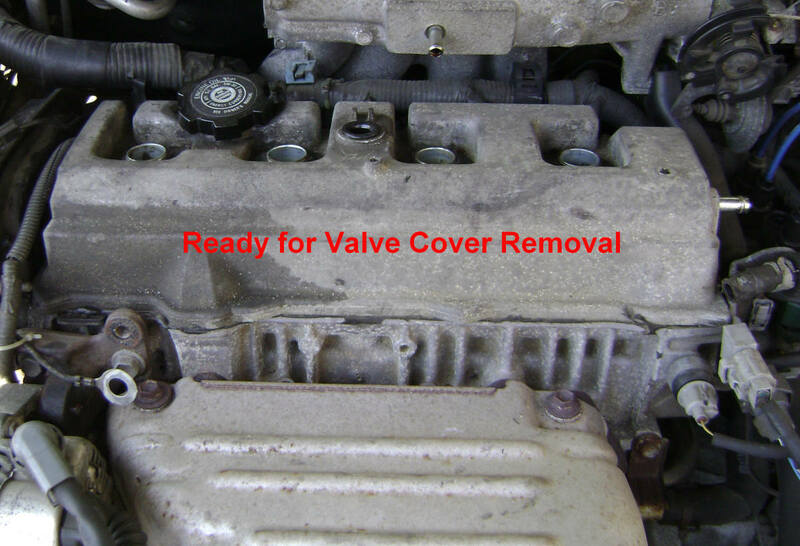 This will ease the removal and installation of the valve cover. Move the hose clamp closest to the intake runner. 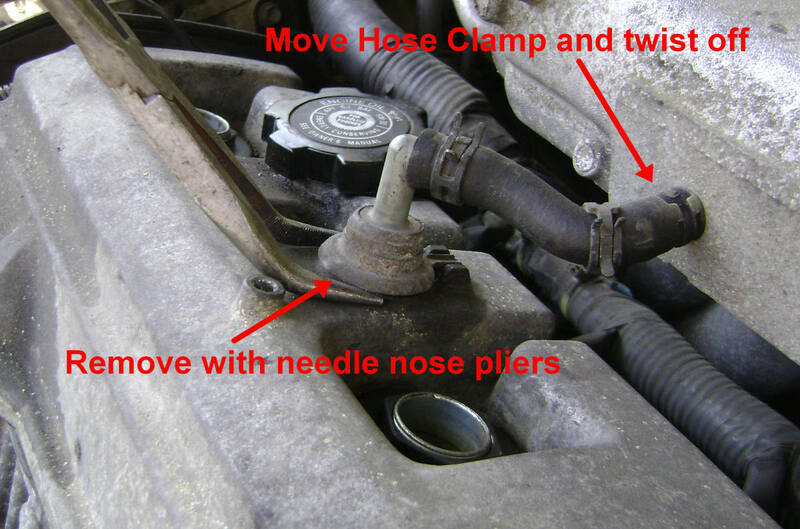 Using needle-nose pliers, pry the PCV valve up out of the valve cover. Twist off the PCV hose, with the PCV valve attached, from the intake runner. 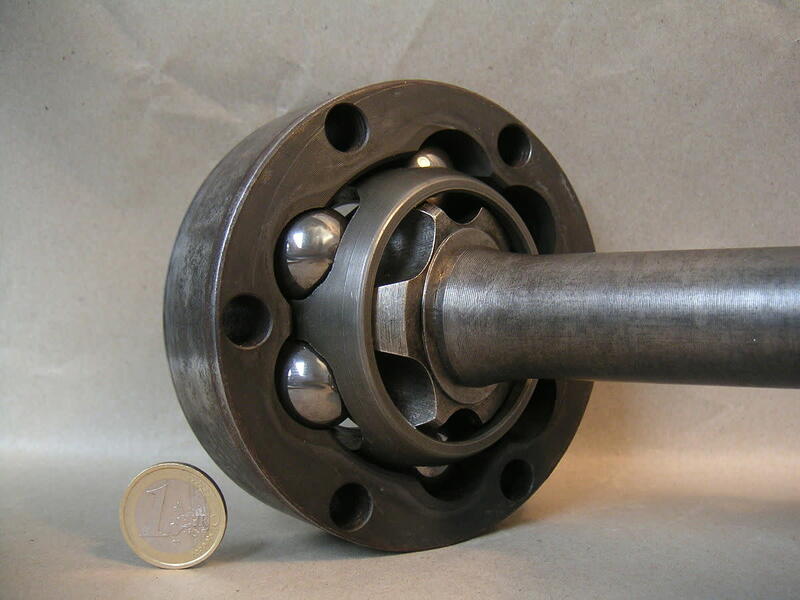 Using a 30 mm socket, unbolt the four 30 mm hold-down nuts/rings. The valve cover can now be removed. The rubber gasket may be slightly fused to the cylinder head; using a pry tool will ease removal. Two 10 mm bolts retain the plug cap. Remove the two bolts. Pry the cap off using a thin-tipped screwdriver. Clean the area where the cap sat, removing oil and debris. 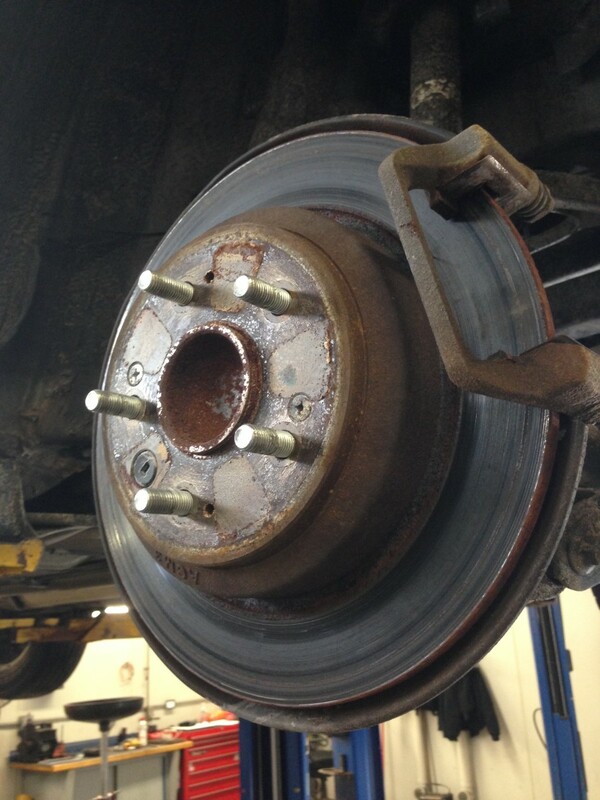 Finish by using any brake-cleaning product to remove oil residue. 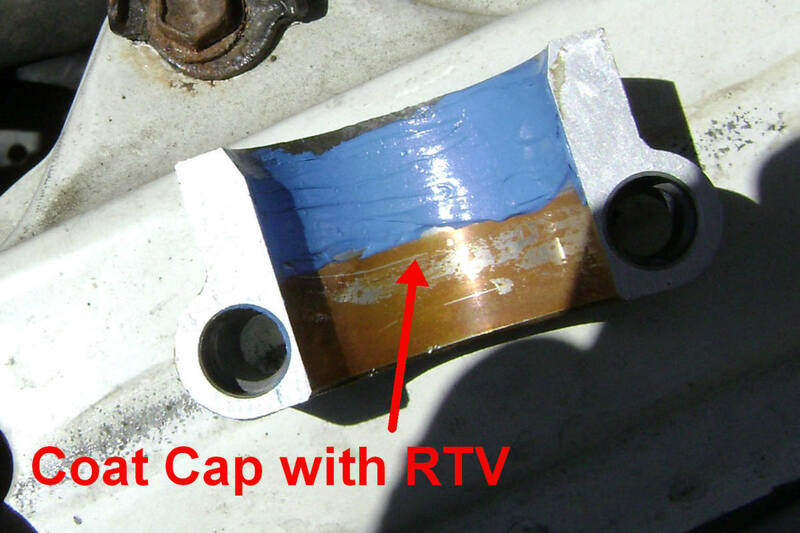 Use any RTV product with gasket-sealing properties. J-B Weld makes an excellent automotive high temperature RTV if you can find it. Coat the base where the plug sits with RTV, along with the cap. Position the plug on the cylinder header. Secure the cap on the plug and re-bolt. My personal preference is to use silicone valve cover gaskets instead of rubber. Rubber will eventually shrink, crack, dry rot, and leak again. Silicone gaskets, if you can find them, last longer and retain their elasticity better than their rubber counterparts. When the new rubber gasket shrinks, re-tightening the valve cover rings will offset shrinkage, but this solution will only work for a while. 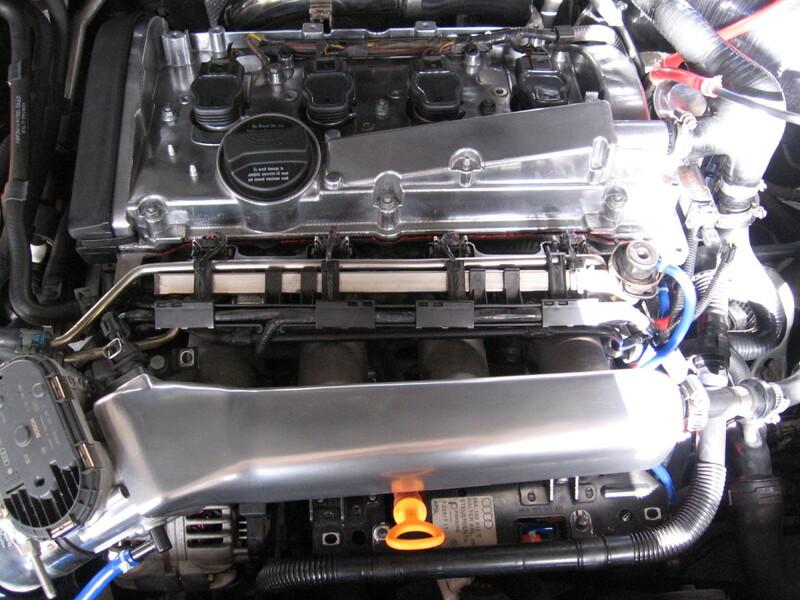 However, I've found valve cover gaskets made by Fel-Pro to be of very high quality with good durability. Dab RTV sealant at the edges where the semi-circle hump ends. Clean the valve cover grooves where the new gasket is to be placed. Removing all oil residue from the grooves will allow the new gasket to adhere to the grooves, which will be helpful during installation of the cover. 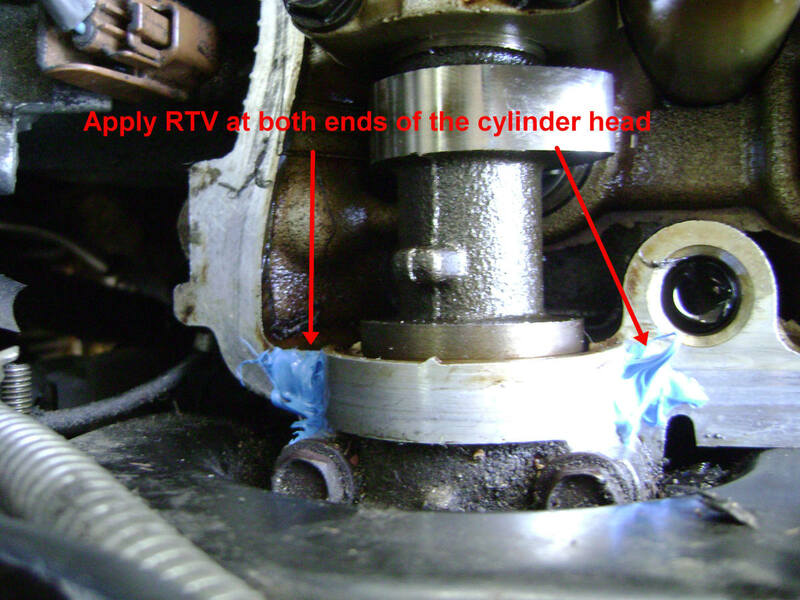 If the new gasket will not stay put, apply a small amount of RTV in the grooves. Re-install the valve cover. The remaining steps are the reversal of the removal process. When torquing down the valve cover rings, spread the tension equally among the four rings. This will help distribute hold-down tension on the new gasket and should provide a good seal. I have a 2001 Camry 5sfe motor and have a bad oil leak. I had the timing belt, cam seal and crank seals replaced but it dropped 2 quarts of oil in 35km. Seems to be leaking from the same side but the seals were replaced. It has a dry gasket cover, but now oil leaking on the right side of the engine. Were else could the leak be coming from? There is a steady drip on the left side of the engine. Any advice? Could be the rear main oil seal (sandwiched between the engine and transmission), the oil pump seal (driven by the timing belt but would be leaking from the passenger side) or the plugs on the side of the engine cover need to be resealed. Recommend you power wash all oil residue to better identify the source of the leak. I have a 199 Camry LE and I think it is burning through oil like crazy. It does appear to be leaking oil however one time I did see a small spot of oil on the ground on the right side underneath the front passenger wheel (2 times). I do see that the front CV axle shift is covered in oil (front side). Where can the oil be coming from? If it's a high mileage car (over 150k) its probably inside your timing belt cover which could be a worn out or dry rotted: 1. 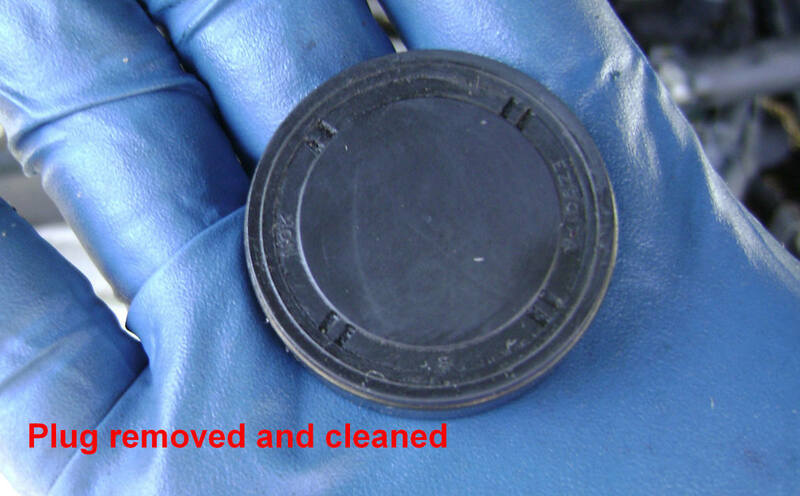 Camshaft Oil Seal 2. Crankshaft Oil Seal 3. Oil Pump Cover Oil Seal. 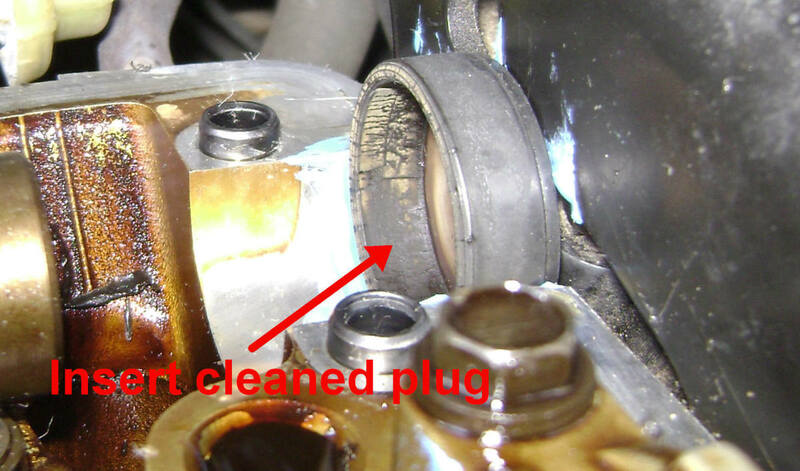 If you car is going though a lot of oil and there's no leaks or blue smoke, then its probably your piston oil rings are gummed up and stuck on the piston groove. This usually happens with car owners who do not change their oil regularly. One way to get them unstuck is to remove the spark plugs and pour a couple of ounces of cleaner into the combustion chamber (like B2 Chemtool you can buy at Walmart) and let it seep and soak the oil rings for around 12 hours. Do this a few times and you oil consumption problem might gradually get better. Note: When you start the car after using the B2, there's going to be a lot of blue smoke. HM, You are correct; I located the bearing bolt spec in the Chilton manual. They recommend 168 in./lbs. which is 14 ft./lbs. According to a Youtube video silicone lasts longer than other materials. But I will find out about a single gasket after I install it. Thanks for the info. If you like I will let you know how the gasket is working after a year. The mechanic that I went to also uses Fel-Pro. I do not know why my 1999 Toyota Camry is burning oil like crazy. I am not seeing many leaks on the ground, however I did see a small spot of oil on the ground towards the inside and underneath the front passenger wheel area. I also saw oil covering the front CV Axle Shift. Where could the oil be coming from? Don't have the torque specs but around 13 - 15 lbs is about right. Have changed my opinion on the Apex silicon valve cover gasket. After around a year, the gasket doesn't seem to hold up as well as the Fel-Pro. Hi. This is a soon to be upcoming project for me. I have ordered an Apex valve cover gasket because they are supposed to be silicone. You mentioned that you prefer silicone gaskets but recommend Fel-Pro. I located this on RockAuto. My main question is about the torque value of the bearing seals. One video had the guy guessing around 13 ft/lbs as this is what he took them off at. Do you know or have a link to these torque specs? I have a Chilton manual and it contains some torque values but not all. 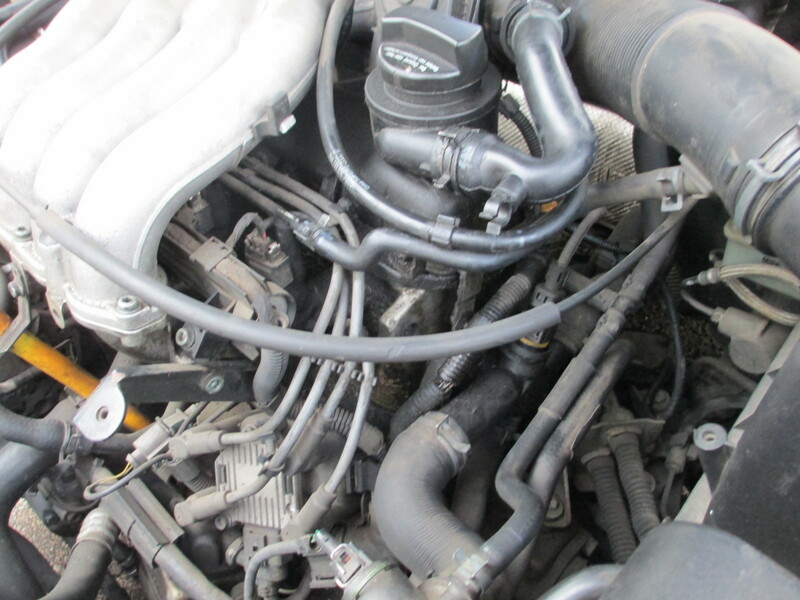 If there's leakage from the rear of the passenger side of the engine, it could be your power steering pump hose. Other sources of leakage is transmission to CV axle shaft seals; power steering pump seal (which is behind the lower timing belt cover and camshaft and crankshaft seal. Do you see any oil on top of the transmission? If so, that's the semi-circle plug between the valve cover and engine head. On my 98 Camry 2.2L I have been getting leaks for a bit, so I notice it was leaking from the valve cover and replaced the gasket so that’s taken care of but I’m noticing it’s still leaking oil from somewhere and I’ve looked around and it’s leaking from somewhere behind the engine, I can’t really tell from where but looks like it’s coming from the intake manifold, would I need to change the manifold gasket or could it be something else? It is a very detailed article. I have been losing oil in my Camry 2001 and I have to keep adding. I see the oil at the top of the engine cover. I will post pictures. I will do some research and see where the leak is. Thanks for UV dye tip. Have a good one. 4. Engine burning oil without producing blue smoke due to piston oil ring being stuck. I have a 2007 Toyota Camry. I have an oil leak that has progressively gotten worse over the last 2yrs. The shop I go to for oil changes, at first look said it was an oil pan not sealing. The seal was replaced but the oil continues to leak. The shop is unable to find an active leak but I go through about 3quarts every 2,000 miles of which I replace as needed. More when driving long distances, or hot weather or with AC use. The shop thinks I maybe burning it but I never see black smoke but I do see oils spots on the cement especially in the AM. The spots are not colored like transmission oil. The spots on the ground are located on the middle-left side of the engine. No drips or pooling can be seen. Not by the left front wheel. At times, the timing is off a bit but as can be expected with an older car with higher miles. The timing usually corrects itself although. In sight? Thanks sbramblet for your kind comments. Can I just say this is a fantastic and well written article? Also the fact that you have been answering questions on it for over a year is highly commendable. You are a gem to the DIY community. I recommend you power wash the engine compartment, let it dry out, then look for the source of the leak. You should then be able to trace the source of any fresh oil leaks. Also take the driver's side wheel off to power wash the underside of the engine as well. Don't forget to cover your alternator with aluminum foil to protect it from water. I have a 1997 Camry that leaks oil onto the transmission where it puddles until it runs down onto the ground. I thought it was the valve cover gasket/cylinder head plug, but after I replaced the gasket and sealed up the plug with RTV like the above article showed I still have a leak. Seems like it could be coming from one of the hoses/lines above the transmission. This is going to be my daughters college car and I'm worried she will run the oil dry so..............any recommendations for a new wanna be mechanic on this car? There's a huge difference between the I4 and V6. To get to the valve cover on the right engine bank (up against the firewall), you have to remove the intake runner / manifold to get enough working room to get the cover off. Also, there's a large wire harness that you have to work around. Is the procedure to change the valve cover gaskets really that different for the v-6 camry? I've been told there are two gaskets instead of 2, are there other things I should be aware of before I do it myself? How often do you change your oil? Every 3 or 4K miles? Being low a quart at that interval is not that unusual. You may have stuck or weak oil rings on your pistons. If stuck, adding around 20% Marvel Mystery Oil can free them up. High fuel consumption could be an out-of-tune engine. May need new plugs, filters (air/fuel), vacuum leak, etc. I have a Toyota camry 1999 xle model. The engine oil of my camry always short that I have to add 1 quart or more in between oil change. I have checked all around the engine no visible leak and no visible smoke coming out of the exhuast. Also the fuel consumption is higher than other 1999 camry I know. Though it seems to work very fine. One kick it starts, accelaration very good, its pack with power. My mechanic couldn't seem to figure out the problem. Any suggestion, please. I suggest you get a 2nd and even 3rd opinion. There's the transmission and the torque converter (never heard of a gearbox oil pump?). The transmission has three oil seals: 1. Left Axle Shaft inner seal 2. Right axle shaft inner seal. 3. Transmission input shaft seal. The torque converter has one seal. Yes, IMHO your problem is like the cylinder head plug. My car is a 1999 Toyota Camry, which seems to have a small oil leak from under the metal bracket on which the ignition coil packs installed. I think the oil drips onto the metal tube connected to the heater core hose and then collects on top of speed sensor. Do you think this could be the cylinder head plug seal problem as mentioned above? My best guess ... worn CV axle bearings or perhaps worn front motor mount. If you've only started to use synthetic oil, that in itself could be the problem. Seems to happen a lot on high mileage Toyotas. One fix is to switch back to conventional oil, pull out all your plugs, pour about 2 oz of B12/Chemtool into each plug hole, put a towel over the plug holes, turn over the engine for a couple of seconds, put back in the plugs and let sit overnight. This could free up carbon buildup on the oil rings that may be partial stuck on the piston oil ring grooves. The rings may not be scrapping the oil residue on you cylinder walls. Did it on a couple of cars and it worked. Also add Marvel Mystery Oil with your motor oil. Change your oil every 2 to 3 k miles ... it will get dirty fast. Take my advice. RTV won't work in the long run. I've replaced a lot of cover gaskets to fix work done by other repair shops that didn't replace the gasket but used RTV as a replacement. I'll give it a year or so before the leak re-appears. I decided to lay a thin bead of RTV silicone down then lay the gasket over top. Apparently when I re assembled the cover over the cheap gasket it got pinched. Going to let it cure for 24 hours and test it tomorrow. Thank you for the input. Then replacement of the o-ring gasket for the oil pump cover or the oil pump shaft seal gasket would be required. Unfortunately, the timing belt must be removed to get to these gaskets. If left as is, oil will get on the timing belt and will cause it to prematurely break...and I have replaced oil soaked broken timing belts. Refer to my timing belt replacement article for work effort details. It's coming from the oil pump cover. Just where is the leak's origin? If the valve cover, and since the engine is tilted, oil should be accumulating on top of the intake manifold by the injectors. If by the Valve Cover Plug (driver's side where the distributor was), then oil would be visible on top where the transmission meets the motor. 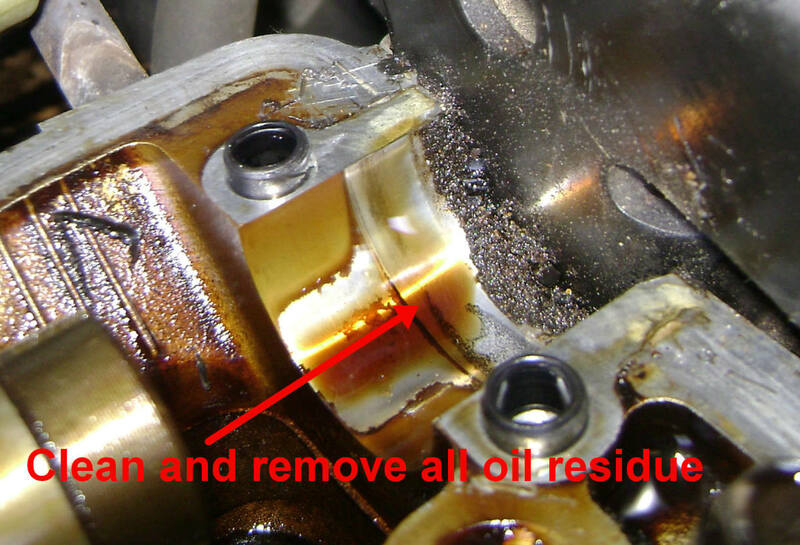 The only other source of oil leak is from the camshaft seal, crankshaft seal and oil pump seal. The oil drips would form by the passenger side front wheel. Other sources of oil would be from the CV axle transmission oil seal. The leak would be present by the middle of the car. If white paper is placed under the car, and since transmission fluid is red, the color would be the give away. The last and least likely (and mis-diagnosed) would be the oil pan gasket. Heard of a lot of shops giving big repair estimates on unnecessary oil pan gasket replacements. Also a split CV boot will throw oily grease inside your wheel well. Suggestion: Double check your work. Lastly, power wash your engine compartment to remove any residual old oil leaks. Then check for sources of fresh leak stains. I just replaced the seal and gasket and is still leaking just as bad as it was before hand. I did have trouble getting the gasket to line up and stay put though. It was a cheap one from O Reileys. Any suggestions on what I should do next? 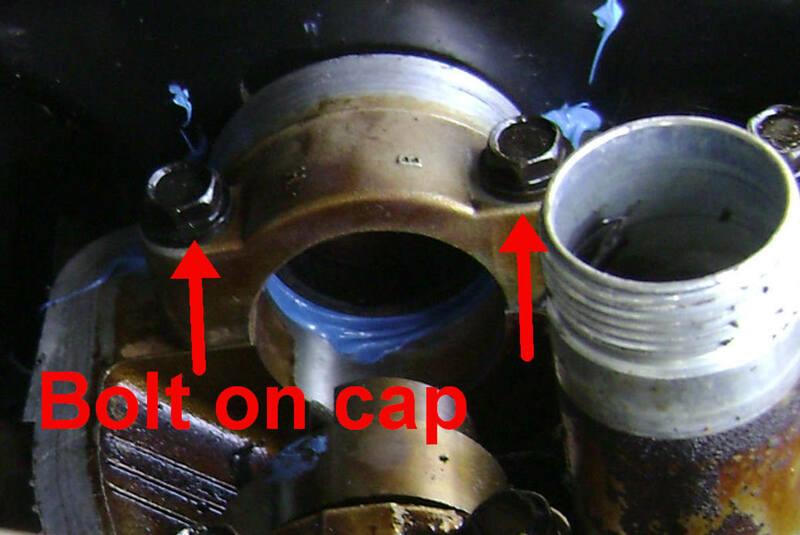 The Oil Pump Cover O-Ring may be your problem. You can apply a thick coat of Permatex Blue Silicone Gasket Maker in the O-Ring groove along with the new O-Ring. This should reinforce the seal and prevent any future oil pump cover leaks should the O-Ring shrink with age. Make sure the mating surfaces is oil free before apply the Permatex. Break Clean works really well. Personally, I do not think the O-ring seal is thick enough to ensure a good long term seal based on my past experience with these O-rings.